Newcastle United have signed Portsmouth defender Mike Williamson on an undisclosed deal in time for the game with Crystal Palace on Wednesday. The clubs have not confirmed the terms for the 26-year-old, who joined Portsmouth from Watford in September but did not make an appearance. If a transfer fee is involved, Watford will receive some of it as part of a sell-on clause in the £2m switch. 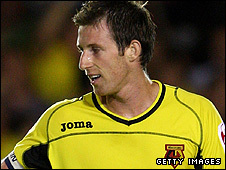 Williamson had only been at Watford for nine months after moving from Wycombe. Williamson started at Torquay, joining Southampton for £100,000 in 2001. However he failed to force his way into the first-team during his five-year spell with the Saints and was sent on loan to Torquay, Doncaster and Wycombe, with the latter signing him on a free transfer in May 2005. A signing that was never played becuse it'd trigger a payment we couldn't afford, how typically Pompey of us. At Adams Park, Williamson again attracted the attention of higher-profile clubs, and the form he showed in their promotion from League Two was enough to persuade Watford to sign him for an undisclosed fee. During his short spell at Vicarage Road, Williamson captained the side and impressed then-Pompey manager Paul Hart enough to sign him for a deal that could have reached £3m.